Tooth realignment procedures extend to a wide variety of treatment options for patients of all types. Depending your specific needs, you may qualify for Invisalign, clear aligners that can take the place of braces or other corrective tools. Straightening crooked teeth not only improve your smile, it can lead to overall better dental health, making brushing and flossing easier, reducing the risk of impacted teeth or gum disease. Teeth straightening can be done not just by brackets and wires, but also by a series of clear, removable “trays” as well. The clear “trays” are called aligners. You wear each set of aligners for 2 weeks before changing to the next set. You need to wear the trays 22 hours every day. Over time, this process gradually realigns teeth by putting gentle pressure on them, without the immediate and extreme adjustment that metal braces or a retainer would provide. Depending on the case, your treatment time varies from around 6 months to 2 years or more. 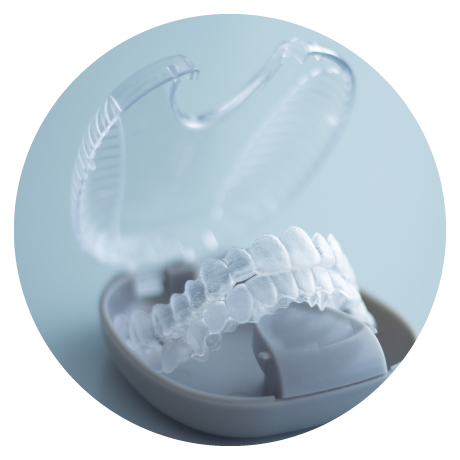 Many patients find clear aligners to be a preferable option for them, and Invisalign is a leading brand that customers love. Clear aligners are made out of a tough, clear resin plastic, custom-fitted to your teeth and yours alone. More than that, they conform so closely to your teeth that you can barely even see them, unlike braces or a retainer. This personalized treatment allows you to Because these invisible dental aligners are removable, you can eat and drink normally, and you can brush your teeth, floss, and maintain dental hygiene, making Invisalign a convenient, easy choice for your tooth realignment needs without getting in the way of your daily routine. Ellerslie 66 is a licensed Invisalign vendor that can assist you in finding the right tooth realignment procedure in Edmonton.